Calling all handy, do-it-yourselfers - National Coatings’ recently expanded their commercial line of watertight roof coatings to provide a solution to you! Our Four Seasons 365 Year Round Protection roof coatings are available in a water-based acrylic coating or a solventless silicone coating with product warranties. These premium roof coating products offer a cost effective; easy to apply solution to solving your roofing issues yourself. They are applied with a roll on application that creates a high build for easy use. Choose one of our energy saving, environmentally friendly 12-Year Ultra Premium Acrylic Coating, 20-Year Ultra Premium Acrylic Roof Coatingor our 50-Year Ultra Premium Silicone Coating. They are ideal for use over: Asphalt, Built-Up, Concrete, EPDM, PVC & TPO, Fiberglass, Granulated Cap Sheet, Metal, Mobile Homes & RVs, Most Existing Coatings, Sprayed Polyurethane Foam and Torch Down. 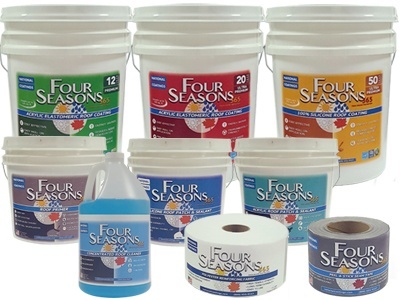 The Four Seasons product line includes everything you need to restore and repair your roof: concentrated roof cleaner, peel and stick seam tape, polyester reinforcing fabric, acrylic or silicone roof patch & sealant and roof primer. Buy Four Seasons Products Here! For more information on our DIY Roof Coatings, download our Free Brochure!